« Next Article: Super-Long Spanish Names! » Previous Article: Everything you want to know about Spain!! Blog Poll: We are a multilingual bunch! Results are in on our latest blog poll. Turns out we have a multilingual group hanging round this blog, and plenty of native Spanish speakers. Our utterly unscientific poll found 28% natives, 30% Spanish as a second language speakers, and 23% and 17%, respectively, with Spanish as a third language, and fourth language or more! 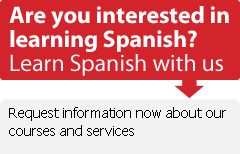 Where does Spanish fall on your list of languages learned? Spanish is the third language I have learned. I already had/have 3 or more languages before learning Spanish. A new poll is up! Please join in. Spanish is my second language..